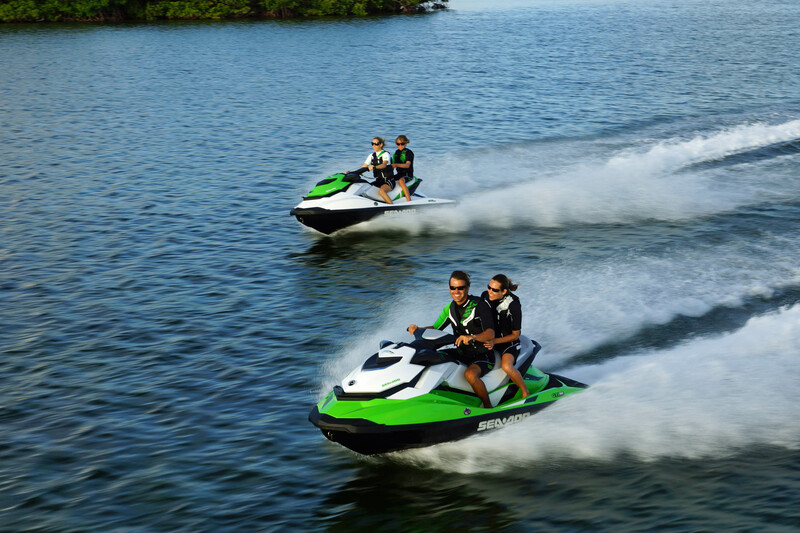 2013 Sea-Doo GTI models provide experienced to first-time riders more control with BRP’s exclusive iBR system. It allows effortless, hands-on-the-handlebars maneuvering at docks with more control than any other watercraft. The GTI family conveys BRP’s advanced design philosophies through contemporary flowing facet styling and new colorization. Improved rider ergonomics deliver more comfort in smooth to open waters. The GTI platform also provides a class-leading 30.8 US gallons (116.6 liters) of storage space and best in class fuel economy with BRP’s award winning ECO mode available on all models. ECO mode increases fuel economy by up to 46%, which represents a savings of up to 298 US gallons (1128 liters) after 100 hours of normal operation* so you spend extra time, not extra money, with your family on the water. The Sea-Doo GTI platform offers a playful, fun-inspired riding experience with a hull that glides on top of the water and also incorporates many ergonomic features designed for greater comfort. BRP’s exclusive inward-angled foot wells keep the rider’s lower legs and feet in-line, reducing ankle fatigue. A plush seat provides a narrow distance between the rider’s knees while sitting or standing and an extended rear platform gives the GTI more space for a quick dip in the water and reboarding. BRP’s Sea-Doo GTI Limited 155 is a striking, luxury-equipped watercraft entering 2013 in all-new Anthracite Grey color. The GTI Limited 155 model is loaded with premium features and accessories that offer increased comfort and advanced iControl technologies. It comes with a plush touring seat, fold-down re-boarding step, Off Throttle Assisted Steering (O.T.A.S), cruise control and slow speed modes combined with iBR and Intelligent Throttle Control (iTC) with ECO Mode. The Limited package’s exclusive features also include: custom cover, dry bag, safety kit, anchor bag, high-performance Variable Trim System (VTS), and additional gauge functions including access to fuel autonomy. With BRP’s 2013 Sea-Doo GTI SE 130/155, fun and peace of mind for the whole family has never been easier, or more colorful. In 2013, the GTI is available in two colour options, Black and Sunshine or new Lucky Green (GTI SE 130 only). Its handling is more intuitive than competitive offerings thanks to a super stable and predictable hull, coupled with iBR and iTC systems. This model comes fully equipped with a plush touring seat, a digital infocenter, ECO Mode, VTS, a fold-down reboarding step, O.T.A.S. and the Sea-Doo Learning Key. When ECO Mode is activated the GTI SE 155 increases fuel autonomy by up to 46% which represents a savings of up to 298 US gallons (1128 liters) after 100 hours of normal operation*. 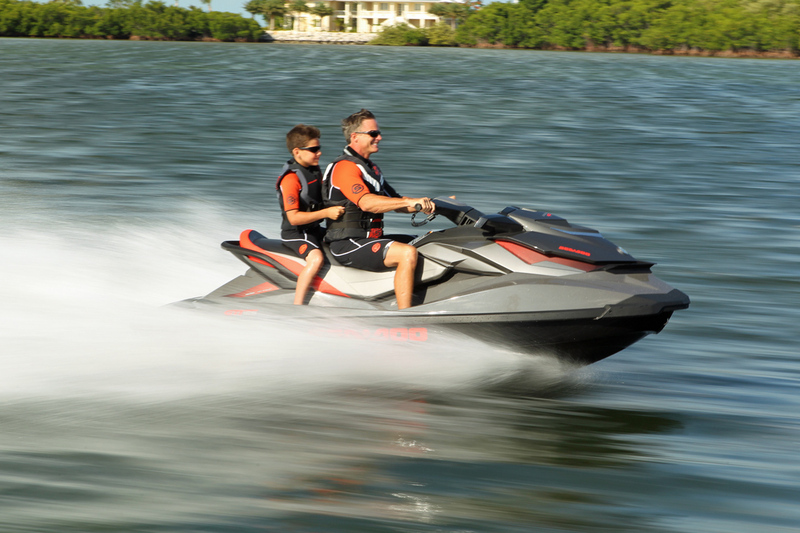 BRP’s Sea-Doo GTI 130 provides greater peace of mind for watercraft riders and their families with iBR and iTC for an added level of maneuverability. With the exclusive Sport and Touring Modes, the GTI 130 also offers greater piece of mind with the Sea-Doo Learning Key, O.T.A.S., Closed Loop Cooling System (CLCS) and Digitally Encoded Security System (D.E.S.S). The GTI 130 is ideal for families as it offers playful handling, while delivering more than enough power to enjoy multiple forms of watersports fun. It is available in Black and Sunshine and new, Lucky green. 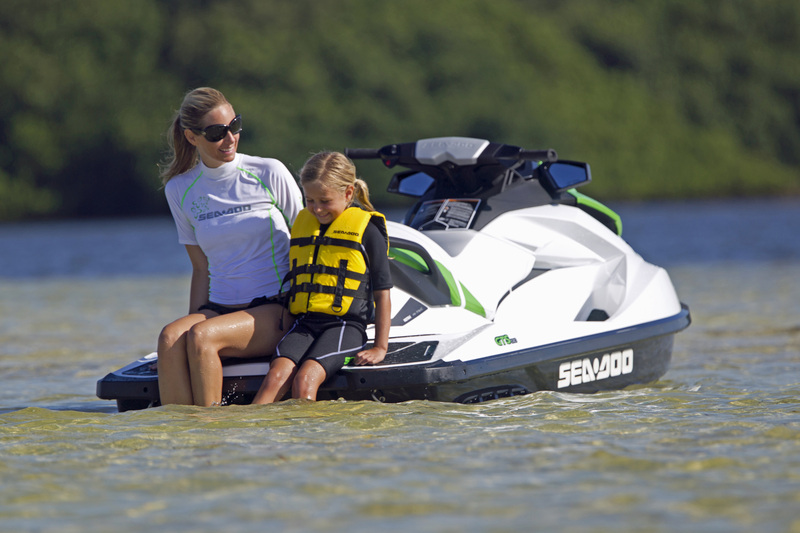 BRP’s 2013 Sea-Doo GTS 130 is a great value for the entire family. It offers new style at an entry-level lower price and is playful yet powerful, it is available in the all-new Lucky Green coloration for 2013, and provides increased peace of mind with features such as Sport and Touring Mode, O.T.A.S., Rear-View Mirrors, Sea-Doo Learning Key, CLCS and D.E.S.S. When will the 2013 power boats be released? Is there information I may review on the web? In 2013 Sea-Doo is no longer manufacturing boats. There are 2012 models still available in some of the dealerships. I have purchased a 2013 GTI Limited in Chile, Southamerica, and i’m traying to enter the SeaDoo Club. By the moment I enter my VIN number, the system tells me that the number is incorrect. Theorically my VIN number is YDV23072I213. When will the 2013 power boats be released? Is there information I may review on the web?! !